We all get robocalls, and our seniors have been especially targeted by scammers. Although many people reported the calls to the Federal Trade Commission database, most of us did not. Even when the numbers were reported, little was done and the scammers just spoofed a different number. Putting your number on the Do Not Call list made no difference since scammers ignore the list. But there is hope. This year has seen major changes including cooperation between the government and industry. There is now real-time data transmitted from the FTC to telecom providers, and so today it makes a difference if you report robocalls. The major phone carriers are using the complaint database to not only block scammers, but also to improve their robocall detection algorithms. Another problem is that caller ID has become useless since the scammers spoof the phone number they are using; this is why calls from overseas come up on your screen as a 914 number. The Federal Communications Commission is testing an anti-scammer technology solution (named Shaken & Stir, in a nod to James Bond), which would result in ensuring that the number that displays on your call ID is the real number. As a result of a government competition a few years back awarding a cash prize for the company which came up with a robocall blocking solution, one of the competition winners called NoMoRobo is offering a robocall blocking program (free for VoIP, $1.99/mo for cellphones). The new rules adopted by the FCC last November allow telecom carriers to proactively block numbers used to originate robocalls. The initial results this year have been positive, but seniors should be aware that many doctor’s offices and pharmacies use robocalls to remind patients about appointments and prescription refills. There have been instances where such calls are blocked by the new anti-robocall technology, and the FCC is working with telecom carriers to fix that problem. The new efforts are making a positive impact in reducing robocalls and blocking scammers targeting seniors. So if you get a robocall, it now makes sense to take action. And if you know of a senior who is getting such calls, let them know to call 877-FTC-HELP or visit the FTC.gov site. The number of robocall victims continues to rise, as does the amount lost to scams. Seniors are particularly vulnerable due to several factors. Surprisingly, the fastest-growing group of victims is the 35-54 age bracket; that group has a lot of personal information available on the internet which can be used to increase the likelihood of a scammer being successful. By taking action ourselves, and by helping our elderly relatives and neighbors to report robocalls, we can make a difference and prevent people in our community from becoming victims. My guess is that Mr. Rolnick’s definition of “rants” that should not appear in the Gazette is different from my definition, but in any event I think the result of Mr. Gingold’s letter illustrates why our both our local paper and Mr. Gingold are positive forces in Croton. I don’t agree with Mr. Gingold’s reasoning nor his conclusion about the Silver Lake fee. At the risk of shocking Mr. Rolnick, not only do I wholeheartedly agree with the decision of the Board of Trustees on this matter but I also thank Ms. Gallelli for providing a reply which suggests a path forward beneficial to our financially-stressed seniors. Although Mr. Gingold is partially wrong on the merits, he is also partially correct. His letter provided a valuable public service quite apart from bringing the Board of Trustees policy change to the attention of readers of this newspaper. Mr. Gingold was upset (see his letter here) that the fee waiver for seniors had been eliminated. He stated that he discovered this when he went to the Municipal Building to get his 2018 pass. Mr. Gingold’s letter made two arguments for the fee waiver. I disagree with Mr. Gingold on this point. Simply attaining a specific age does not confer any superior social status. For example, we respect the wisdom of our elders, but that has nothing to do with age per se but rather because they bring a wealth of life experience and knowledge which warrants their opinions and advice being taken seriously. And if the basis of a municipal fee waiver is “substantial contributions” made by a waiver applicant, then this has nothing to do with age but rather would require an evaluation of what each resident has contributed to Croton. As such, a blanket waiver on seniors would be both over and under-inclusive with the only solution an impractical and cumbersome one. The second argument made by Mr. Gingold is that many seniors have financial constraints greater than the general Croton population. This is a legitimate concern that should be taken seriously. I have said for years that the Village policy was too restrictive on ID card issuance and also that it was unduly burdensome on lower-income residents and particularly families. Last year there was a policy change loosening the proof requirements for getting an ID card and an expansion of hours to accommodate parents who work during the daytime. That was a welcome change. But it did not address my other concern as to the exclusionary impact of Village policies on lower-income residents of our community. It is here that Mr. Gingold’s letter had a positive impact. In response to Mr. Gingold’s letter, trustee Ann Gallelli replied (The Gazette, week of April 26-May 2) with a letter making two points. At the risk of once more shocking Mr. Rolnick, I think that Ms. Gallelli was correct on both of her points. Ms. Gallelli’s first point was that this modest fee is to partially offset the cost of improvements which will benefit a narrow group of people and that the Village is undertaking these improvements at the specific request of the group of people now being asked to bear a $1 fee. I often disagree with Ms. Gallelli on Village budget matters, but I don’t see how anyone could disagree with her on her position on asking that Silver Lake patrons make at least a token contribution for these particular upgrades. While I find Croton Point Avenue to be a boondoggle and Gouveia to be an eternal money pit, the distinction Ms. Gallelli makes with the Silver Lake fees is a valid and important one. I disagree with Ms. Gallelli on CPA and Gouveia, but those projects are ones which are arguably intended to benefit the municipal populace as a whole. That is not the case with these specific Silver Lake improvements. Mr. Rolnick and Mr. Gingold disagree on substance but both feel that the Silver Lake fee is part of a larger debate. If you accept as reasonable Ms. Gallelli’s explanation (which I do), then this is an entirely sensible and non-political action and not part of any larger issue. Ms. Gallelli’s second point is actually the most important data which has come out of this whole exchange, and if not for Mr. Gingold’s letter it would not have come to light. This not only goes to the heart of objections raised by many residents (not just Mr. Gingold) regarding Silver Lake, this is a program which benefits financially-stressed families who wish to be a part of all of the municipal activities in our community—not just Silver Lake. I would urge Ms. Gallelli to speak with the Village Manager about ensuring that affected residents are aware of this program. This can be done by putting a notice on Recreation & Parks application forms that require fee payment. Something along the lines of “If you are experiencing financial hardship, fee waivers are available. Contact 271-xxxx” would let people know that they shouldn’t just throw away the flyer before the kids see it and the parents don’t want to tell their kids the family can’t afford to let them attend a Village event. Another avenue for outreach is the Croton Seniors who meet at the Muni Building: remind them to spread the word to fellow seniors who are in need. Many of our churches have programs assisting our low-income neighbors, and also assist residents who may customarily consume information in Spanish or other languages and therefore not know about the Village fee waiver policy. Organizations such as Croton Caring Committee and the Lions already work with some of our neighbors who will be glad to find out that the Village wants them involved in our recreation programs. I also think that fee waivers should be accepted by Recreation & Parks at any time that someone has need to apply, not just during a limited time window. At least this should be tested for a year, particularly since the 2018 deadline is just a few days away. This past month has been a bit of a bummer for anyone who relies on Croton social media to shape their perception of Croton or get news about Croton. That is a discussion for another time. The Gazette has been a refreshing counterpoint to online negativity. I thank Mr. Gingold and Ms. Gallelli for putting their views forward in the pages of this newspaper. I often disagree with both of them, but I pay attention to their views and find their writing to be well-reasoned. At the end of the day, their dialogue on Silver Lake has been enlightening and beneficial for our community and they have provided a path forward for the rest of us in Croton. Last year, many members of our community were upset over the opening of a vape shop in Croton. Marijuana retail stores in Croton are not likely to be as controversial as e-cigarette merchants, but the pending legalization of marijuana in Croton is coming at a rapid pace and some legislation and education outreach needs to be done now. It is time for us to have a conversation and make some decisions about Village laws and policy. 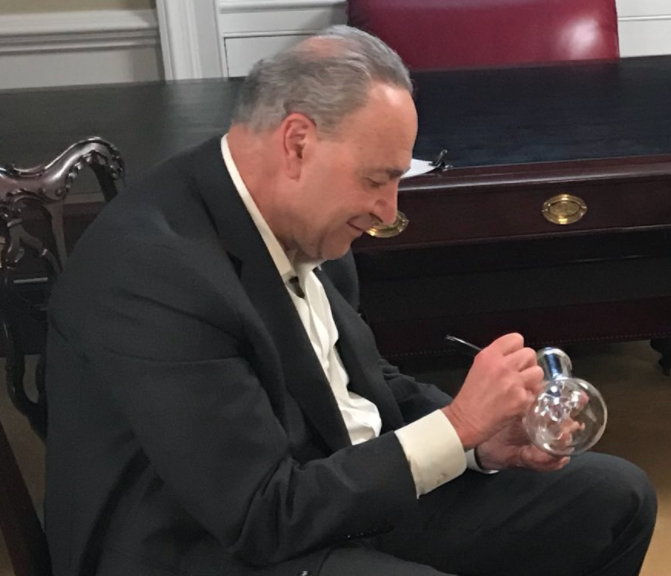 Senator Schumer signing a bong. I personally don’t think that marijuana sellers need government handouts to prosper, but the fact that this is being proposed by the senior elected official of the national Democratic Party indicates how quickly the pot industry is becoming a major political lobby. In an interview with Vice News broadcast on HBO, Minority Leader Schumer acknowledged that the current Republican majority in the U.S. Senate would block his program. But with the latest national polls giving the Democrats a strong chance of regaining the Senate, Mr. Schumer is a strong candidate for Majority Leader. We may be looking at traveling all the way across the spectrum from federal criminalization to federal government subsidy of marijuana by the end of 2019. Locally, legalization is even closer. With the defeat of Republicans in New Jersey, incoming Governor Phil Murphy told the Legislature that he wanted to see legalized pot in Jersey by the end of 2018 and he is using a working projection of $60 million in state marijuana tax revenue as part of his upcoming budget. Regardless of your personal position on marijuana, legalization is inevitable if only because of the huge amounts of money involved. Last week, banking behemoth TD Bank approved their Canada-based investment counselors recommending three marijuana companies listed on the Toronto Stock Exchange, and USA Today said that marijuana sales in California alone will be $3.8 billion this year. New York has been a rare outpost of Democrat opposition to pot. Governor Cuomo has been opposed because he is concerned with the social consequences and possible “gateway drug” issues. But with our state Assembly being pro-legalization, and with both Senators Schumer and Gillibrand and primary opponent Cynthia Nixon coming out in favor of pot, Mr. Cuomo has become isolated on this issue. While Mr. Cuomo’s reelection remains probable, the N.Y. Senate is likely to flip to Democrat control; hence the Governor’s face-saving decision to set up a “task force” to “study” the issue. While most Croton residents are likely to agree with the pot-legalization advocacy of our Democratic Party elected officials and support the opening of marijuana stores in Croton, there is still a question of Village zoning and the degree of law enforcement monitoring of the stores. During a recent stay in Denver, I was surprised at the social impact of pot. The public buses reeked of marijuana. On a bus ride back to our hotel from the Denver Zoo, there was a disturbance when one obviously high passenger missed the stop for the “dispensary” and demanded the bus driver pull over to let him out. A Colorado tourist official told me that “they came for the pot and stayed for the heroin” and she added that there was concern about the sense of decline and lawlessness in downtown Denver having an effect on tourism. A resident in suburban Highlands Ranch told me that she and her husband don’t go downtown anymore because of the conditions since legalization. Croton is not Denver, and the impact here is likely to be much less. But one Denver lesson may be applicable to Croton, and that is the ramifications of product mix sold in marijuana retail stores. Aging hippies in Croton can look back fondly on the days when they would toke a doobie during the Summer of Love. But millennials and teens in 2018 Denver have made “edibles” a majority of sales at some “dispensaries.” In addition, concentration of THC in marijuana products is much greater than it was back in olden times. Overdoses are not a great concern with adults (passage of time will usually cure any symptoms), but children are a different matter. Children’s Hospital Colorado reports a small but disturbing surge in infants and pre-teens ingesting “edibles” and being treated for respiratory problems, including intubation of a 3 year-old, “continuous positive pressure for respiratory insufficiency” for an 8 month-old infant, and the death of an 11 month-old. Cause of death in the 11 month-old is disputed, but the doctors state that the infant arrived at the ER in an unresponsive state with rapid heartbeat, and a urine drug screen came back positive for high levels of THC. Although mainstream media and an increasing number of national politicians dismiss the Denver experience as an anomaly, Colorado Gov. Hickenlooper (D) signed the “Gummy Bear” law banning edibles in the shape of animals and fruits. If New York State does not enact such limitations, then the Village of Croton should consider passage of a local law. In a family town such as Croton, the Colorado experience with “edibles” should be a cause for concern among our parents and teachers. In addition to immediate physiological impacts on infants, there are concerns both due to the effects of THC on teenage brain development, and also due to the use of pot by teens to self-medicate; thereby masking underlying emotional issues that would normally be spotted by parents and teachers. Our Croton school district leadership needs to decide how to educate students about pot. Many of their students are going to be coming from homes where parents will smoke pot and consume “edibles.” It is going to be difficult if not impossible for schools to convince students that consumption of marijuana is harmful when the students see pot used in their own home or when they visit the homes of classmates. DARE’s curriculum at the high school level stresses resistance to peer pressure, providing data to show that it is socially acceptable to decide not to ingest drugs. Unfortunately, while it is true that consumption of alcohol or tobacco is not actively promoted by parents or politicians, this is no longer the case about marijuana. No politician would sign a carton of cigarettes or case of beer, but in this state our politicians will autograph a bong. New York politicians are openly enthusiastic about pot, and—in the case of Mr. Schumer—even want to put tax money toward promoting marijuana businesses. But there are longitudinal studies suggesting impairment of verbal cognitive functions in children, with a direct relationship between age of first use and impact. A New Zealand study concluded that even when high-consuming pot-smoking teens stopped as adults, there was permanent reduction in IQ test scores. For obvious reasons, there has not been much research on human in utero exposure; but animal studies show cognitive impairment in adult rats, likely due to effects of THC on development of the hippocampus (the brain area involved in memory formation). Most studies on the effects of THC on brain development have been performed on lab rats. In New York, we are about to embark on a massive experiment with our children as lab rats. My personal libertarian perspective would normally lead me to join Sen. Schumer, Sen. Gillibrand, Ms. Nixon, and other New York politicians in welcoming state-wide consumption of marijuana in all its glorious variants. And I realize that marijuana criminalization no longer has voter support, either nationally or locally. But after observing Denver and speaking with people living there, I am concerned about the impact of the coming legalization here in Croton. At very least, the Village and the school district should start involving residents and parents in preparing for the coming legalization of marijuana and we should consider whether to pass new zoning laws now, rather than waiting till after the fact. Seniors of Croton, unite! The village board is coming after us with guns blazing. The other day my wife and I went to the Municipal Building to renew our Rec passes, which expire next month. After our new cards were issued came the shock—and the outrage! For years, no, for decades, Croton seniors have been issued free passes for Silver Lake. This in recognition of our status and in compensation for the substantial contributions we have made (and continue to make) to the village during our younger years. But when we requested our Silver Lake stickers for this season, we were rebuffed. It seems the board, in its infinite wisdom, has chosen to reverse this venerable policy and, henceforth, seniors will be charged a fee for entry into our favorite swimming hole. Yes, the fees are moderate. And yes, many of us can reasonably afford them. But there are also those in our village, many on fixed incomes, who struggle every day to remain in their homes in our high-priced community; and for whom every dollar is important if they are not to be driven from our midst. And how much can the board possibly expect to reap from these folks in comparison to our $19.5 million budget? A pittance at best. So what is behind this slap in the faces of our oldest residents? Is the board that desperate to glean every nickel from every source to fund its pet projects like Croton Point Avenue and Gouveia Park? Is this how they respond to the Financial Stability Committee’s warning that village expenses will soon exceed its revenues? It is sad to contemplate that, during a hot, muggy day this August, some of our senior citizens may be forced to forgo the opportunity to cool themselves in the waters of the Croton River, or to just sit in the sun and reminisce with old friends about the good old days when our village board actually cared about all of the residents of Croton, not just themselves and their friends. The smashing of a vehicle window in Croton is disturbing (The Gazette, week of April 5-11), and that the victim is a hardworking immigrant who actively supports our community makes this an embarrassment for Croton as well. Occurring in broad daylight just steps from a daycare center, the timing and place of this vandalism should be a wakeup call. When people feel they can do this with impunity, it creates an environment which is damaging to public safety and to property values in our Village. I hope that somebody comes forward with information to apprehend the vandal. The vandalism comes in the context of other developments. The Upper Village has gotten a shabby look in recent months. In addition to the ugly vacant storefront at the former Three Dog Bite, exterior storefronts have become billboards for advertising flyers. The row from the Chinese restaurant down to the former German deli now sports a variety of flyers, which remain even after they have been exposed to wind and rain. A word of thanks is due to ASAP Mortgage, which has always kept an attractive storefront since it opened last year. If every business owner and landlord followed their example, the Upper Village would be a better place. Not only does the Village refrain from doing anything about the growing eyesore, our Village has chosen to add to the visual blight by putting up “Solarize Croton” flyers alongside the other advertisements. Solar energy is a wonderful cause to promote, but I don’t think the Village needs to litter in order to do so. I do give credit to the Village for last week’s clean-up of the municipal land along Old Post Road opposite the Municipal Building. It had come to the point that the Bud Light cans and potato chip wrappers had been joined by a single white ankle sock which laid in the middle of the sidewalk. Perhaps it is time to consider a small trash can. Yes, people should take their trash away. But they are not doing so, and since this is part of the Village trail system a bit of pragmatic action by the Village is not unreasonable. The Village of Croton gives a lot of thought to problems such as the proper level of federal funding for the National Railroad Passenger Corporation and where Comptroller DiNapoli should invest the state pension fund. And no doubt the leadership in Washington and Albany eagerly awaits the latest pearls of wisdom from Croton. Compared to weighty matters of state, a smashed car window or visual pollution are unworthy of great minds who “think globally.” Indeed, in the current environment it is downright reactionary to suggest that the Municipal Building focus on such pedestrian concerns. But unlike events in Washington or Albany, the Village can have an immediate positive impact on the conditions in the Upper Village. Moreover, if we don’t think locally and act locally nobody in Washington is going to do it for us. There are specific steps which can be taken. First is to reach out to the landlords of the retail properties. If they have allowed the posting of these flyers, then they should be encouraged to rethink that permission or at very least to have the flyers posted on the inside of the window. If they have not given permission then the Village should consider implementing and enforcing appropriate code provisions. In addition, the Village should encourage owners of vacant storefronts to maintain the property in a manner which takes into account the impact of aesthetic factors. The value of the landlord’s property is tied to the desire of entrepreneurs to rent, and who wants to open a store on a blighted street? The local business community also has a stake in having an attractive and safe Upper Village. Working with the Chamber and the Rotary, the Village can leverage the knowledge and enthusiasm of people whose focus is on retail sales development. Croton’s arts community is another resource: some communities such as East Hampton and Riverhead have worked on bringing together artists and landlords to utilize the vacant frontage as an artistic forum. I realize that local issues are not the top priority of our village board. But we have some sharp Village employees, and perhaps they could deal with the current state of the Upper Village while our elected officials are busy saving the planet. All of us as Croton residents can do our part by making an effort to shop local, and support our Croton businesses. Retail is changing permanently, and unless we want decaying streetscapes we need to welcome businesses who are willing to contribute to our economy. In the last 2 years, Croton has seen a number of foodservice and beauty establishments open. Unfortunately some residents went on social media to complain about having too many delis and nail salons. This negative attitude is short-sighted and based on the idea that Croton can turn back time. When prospective tenants read negative and hostile comments on Facebook “community” pages, they look elsewhere. We don’t have the population density to bring back artisanal toy stores or bookstores, and that is a reality we need to accept in the online era. Smashed car windows and vacant storefronts are not a good image for Croton. We need to spend some time thinking locally and acting locally. Senator Schumer and Senator Gillibrand’s support is vital to passage of a bill which will expand opportunity for visually-impaired people here in Croton and worldwide. Passage of S.2559 will enable our libraries in Croton and Ossining to give the visually-impaired members of our community access to the same resources most of us currently take for granted. Senate Bill 2559 is the next step in our nation implementing the Marrakesh Treaty, providing a limited copyright exemption for libraries to make information available to people with disabilities. Locally, the Marrakesh Treaty will benefit visually-impaired people here in Croton and the surrounding community. In particular, the American Library Association notes that Spanish-speakers in the United States will benefit from increased ability to access native Spanish content from around the world. In developing countries, less than 1% of print content is accessible. We live in the information age, and excluding people from access to information means excluding them from participation in our society. By allowing import and export of existing accessible resources, we will avoid wasting money on duplicative transcription efforts and increase the amount of information available worldwide. For more than a decade, advocates for the disabled have worked alongside academics, librarians, and diplomats to get to where we are now. The bill is currently in the Judiciary Committee. Please call Sen. Schumer at (914) 734-1532 and Sen. Gillibrand at (845) 875-4585 and ask them to co-sponsor S.2559. The following letter appears in this week's issue of the Gazette. The article about rental of the Gouveia residence (The Gazette, week of March 1/7) was déjà vu all over again. 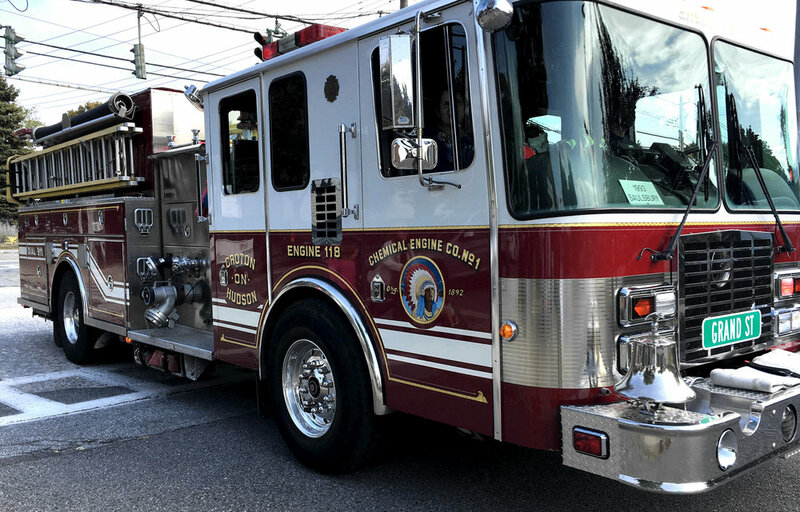 As noted in the article, the Village now finally admits it cannot use the building for public use without major renovations, although then-Mayor Leo Wiegman had assured Croton that the building could be made ADA-compliant without taxpayer money. The Board of Trustees proposes to square that circle by renting the building as a private residence after the expenditure of $40,000 in taxpayer money. That “lowball” amount is obtained by ignoring the requirements of the Americans with Disabilities Act, but our Trustees won’t tell us how they can avoid compliance with a federal law. This is the same discussion Croton taxpayers had more than five years ago. Some argue that use as a single-family home takes the building outside the ambit of the ADA. Others disagree, saying that as a municipal corporation, the “landlord” would seem to be covered under Title II and not Title III. Even if the Village is for this limited purpose covered under Title III (a dubious assumption), there may still be ADA requirements if the renter has a home office used for meeting clients. In addition, there may be accessibility obligations under Section 504 of the Rehabilitation Act, the Fair Housing Act, and other federal and state laws. Any balancing test of what modifications are “readily achievable” would necessarily take into account the deep pockets of the “landlord” and as our Board of Trustees will gleefully acknowledge, there is an unlimited pot of money to be sucked from the wallets of Croton taxpayers. That means that any refusal to make Gouveia ADA-compliant on the basis of unreasonable cost may be problematic. If the Village is covered under Title II, the provisions of 28 CFR 35.102 and 35.151(b)(1) would appear to cover the Gouveia property under pretty much any use other than a bus depot. If the “lowball” cost of $40,000 is designed to set up a disproportionate cost defense, then there still should be a written analysis. Moreover, there may still be a problem if during the subsequent 3 years the Village undertakes further renovations. As residents of Croton, we have no idea what the official position of the Village is because our Trustees and Village Manager simply refuse to discuss the issue with us. 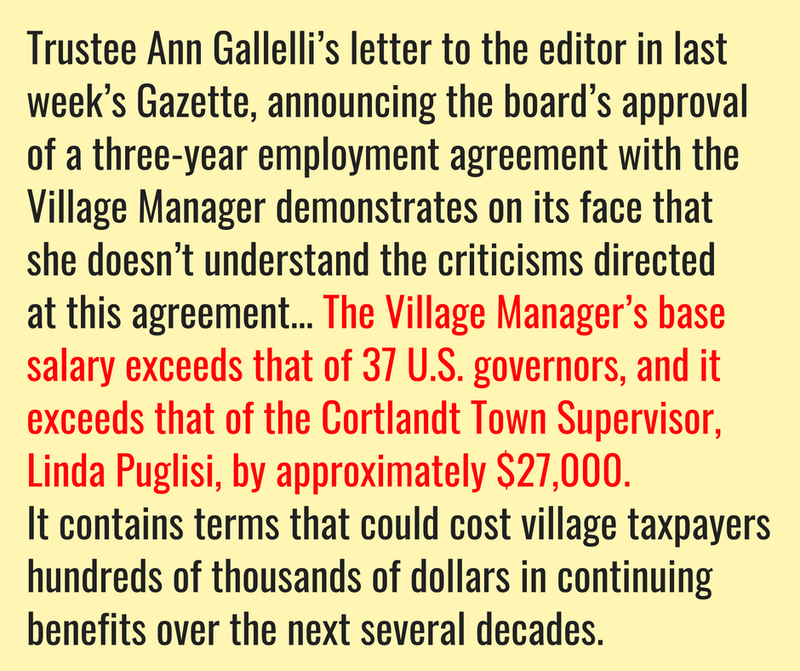 Nobody is questioning the competence of the Village Manager and no doubt she has done her predicate research, but the Board’s refusal to discuss these matters is odd. Regardless of the requirements, as residents of Croton, we need to ask ourselves whether in 2018 we are the type of community which would initiate a new facility that cannot be used by those with disabilities. It is bad enough that the Village chose to throw a few picnic tables out on the sloping lawn but declined to provide a pathway for people in wheelchairs or walkers to reach the tables (apparently they should be content to sit on the portion of the parking lot which the Village decided to pave). Do we really want to rub it in to our disabled and elderly residents? An even more basic recurrent question which the Board of Trustees has never publicly addressed is whether Croton may even rent the building as a private home. In Croton, “Groundhog Day” is not a movie, it is a governance model. Even while Ms. Gouveia was alive, questions were raised about the applicability of the public trust doctrine to the proposed revenue-producing activities at Gouveia Park. As discussed many years ago, in NY state the idea that public parkland is held in trust is about as engraved in stone as is possible. The land is titled in the name of the municipality, but the Gouveia parcel is owned in public trust and the power to regulate use is vested in the Legislature up in Albany—not the Croton Board of Trustees and not the Village Manager. The Trustees refuse to tell the people of Croton why they can give public parkland to a private person without leave of the state Legislature. There is no indication that the citizen committee ever considered this when they wrote their report on possible uses for the park, probably because the committee was given a very narrow charge and firmly instructed not to deviate. So it is understandable why the citizen committee did not address the public trust doctrine in the January 13, 2015 report which suggested use either as a private residence or private office space rental. The 2015 report specifically states: “Long-term rental can be achieved without much work” and contemplates “a two-acre site.” Even as the citizen committee was drafting that report we all knew that such proposed “long-term” use was likely a violation of law if legislative approval was not obtained. Nobody wanted to discuss the cost or mechanics of obtaining approval from Albany. Fast-forward to 2018 and our Croton Trustees are going to erect a permanent fence around the building. That is about as alienating as you can get with a plot of land, and the folks whose land is being taken is we the people. Naturally, the home is situated on the best part of the property, and the best views are from inside the home; the new occupant will have the option of looking out from their choice of lower patio (with a new $4,600 railing) or upper patio ($5,200 railing). The parkland being alienated by our Trustees is the prime acreage with the magnificent house that Ms. Gallelli gave such tantalizing reviews of back when we residents naively thought that it was to be public access. Now, we the lowly taxpayers are left with metal picnic tables and affixed hard benches where we will be (literally and figuratively) looked down on by the occupants of the home from behind their $6,000 locked gate and taxpayer-funded $7,000 perimeter fence. Franklin Roosevelt worked to put a chicken in every pot; Croton Trustees use taxpayer money to put a coq au vin in every Viking range. No doubt the perimeter fence is another one of those issues which have been discussed and resolved prior to the Board putting a renovation budget together and announcing the intention to alienate public parkland for private use. I realize that the Village Manager is highly experienced in municipal matters and has lengthy service in a Village which has large amounts of parkland. Ms. Gallelli and Mr. Murtaugh have long involvement in Croton politics during the time when the Gouveia acquisition was discussed and finalized, Ms. Attias and Mr. Pugh are attorneys themselves, and the Board has a Village Attorney at their meetings. These are not incompetent people who lack knowledge of the problems relating to application of the public trust doctrine to Gouveia. So obviously this has been satisfactorily resolved after discussion. But any discussion did not take place in an open public meeting and the Board refuses to tell us their conclusion and the basis therefor. I can understand the Trustees refusing public discussion of their conversations with Village Attorney Staudt, but at very least an opinion letter explaining why the Village can alienate public parkland and also refuse to make the building ADA-compliant should have been appended to the agenda supporting documents when this matter last came before the Board f Trustees. Former Mayor Dr. Schmidt never discussed the public trust doctrine, but his administration never proposed alienating public parkland. By contrast, his predecessor and his successor have been quite open about their intent to alienate public parkland and yet neither of them have ever addressed the moral or legal aspects of such action. This is not an obscure issue, and was even discussed in popular media last year due to the re-development of the Shea Stadium site in Queens. So why won’t our Trustees discuss this subject with the taxpayers of Croton? The reason we know about the Shea Stadium site is because of an Article 78 proceeding which went all the way up to the highest court in New York. Do we really want to get embroiled in lengthy and expensive litigation rather than put the facts out on the table now? Our Board of Trustees refuse to discuss why the carving-out of parkland would not run afoul of the public trust doctrine, or in the alternative what communication the Village has had with Senator Murphy and Assemblywoman Galef about gaining assent of the Legislature. Even if the Board of Trustees finally gives us an explanation as to the ADA and alienation aspects of the Gouveia rental, there is once again the matter of the classist attitude of our Trustees. Just a few weeks ago, the Trustees voted to change the village law to promote “affordable” housing and even promised to waive zoning laws if a developer put up sufficiently large numbers of such units. As a practical matter, that decision is going to apply to Harmon and to Riverside near Brook Street. Those are neighborhoods occupied by hard working people frequently treated as an afterthought by elected officials in Croton. By contrast, the grand renovation of Gouveia being done at taxpayer expense is in one of the wealthiest parts of the Village, near the ultra-exclusive Hudson National golf course and Audubon sanctuary. No high-density housing in that part of the Village, which is why the Village Manager says she will demand rent of $66,000 per year. I realize that $66,000 is a pittance to our Trustees and Village Manager, but there are members of our Croton community who don’t make that much in salary in a year. Given a customary 40x multiplier (30% rent to income ratio) that means that Gouveia will be occupied by someone with a minimum annual income of $220,000. According to Wikipedia, Croton per capita income is $39,441 and median family income is $100,182. That means that the renter sleeping in the bedroom at Gouveia will have more than double the median income of the hardworking families being taxed to buy that $2,400 carpet for the Gouveia bedroom. Speaking as someone who got his house carpets from the ABC Carpet remnant basement and on clearance at Bloomingdales, this strikes me as unjust. But then again, our Trustees and Village Manager live in a more rarified environment and they wouldn’t want their tenant to have to live like a (gasp!) Croton taxpayer. If Ms. King or Mr. Pugh want to meet me at ABC Carpet, I’m sure we can find a good new carpet at a reasonable price. I will even help load it into the van and unload it at the Gouveia estate, provided they let me take a quick look out from that upper patio. Mocking other people for eating disorders is not funny. When adult leaders in the Croton community engage in food-shaming, dietism, or fat shaming, it signals to children and teens that such bullying behavior is acceptable in Croton. Orthorexia is a relatively new term for a problem that has been around for decades: a fixation on pursuing a “healthy” diet. Hollywood celebrities have long pushed fad diets, normally to women. As fat-shaming has become less acceptable, diet-shaming has come to serve the same purpose and possesses the same misogynistic applications. The theme that Mr. Trump’s consumption of McDonald’s food and Diet Cokes is related to his professional qualifications is not new; last year physician James Hamblin even wrote in The Atlantic that Mr. Trump’s dietary and exercise choices “would seem to offer insight” into Trump’s North Korea policy. I don’t know what Mr. Pugh eats, what his Body Mass Index is, nor how much Mr. Pugh exercises (if at all). Nor do I care. If Mr. Pugh was being mocked online for his personal life choices, I would be the first person to tell the bullies to knock it off. But let’s be honest here: Mr. Pugh has critics of his policy positions, and some Croton residents have said that his fondness for increasing Village debt is evidence of poor judgment, but nobody has ever said that Mr. Pugh’s diet is relevant to the question of how he fulfills his official duties. I wonder why none of Mr. Pugh’s colleagues told him that the Facebook post should be removed. Sherry Horowitz is an educator. Does Ms. Horowitz permit her students to gang up on a student who brings the “wrong” type of food in their lunchbox? Does she tell her students that classmates who go to McDonalds have parents with bad judgment? Does she tell her class that it is OK to diet-shame so long as the target has different political views? If Ms. Horowitz does not permit her 5 year olds to bully and mock based on diet or body image, then why does she tolerate such behavior from grown men? Diet-shaming of a man is rare, probably because of the gender double-standard. MarketData Enterprises notes that 90% of Weight Watchers’ members are female, and when looking at social media posts from victims of diet-shaming all of them I could find were from women, with several specifically from mothers who had been shamed for taking their children to McDonald’s. Online posts such as the one authorized by the Croton Democratic Committee are not only in bad taste, they can also serve as a trigger for persons with eating disorders and body image issues. In addition to the gender element of this online bullying, there is also a classism aspect. Going to Five Guys or Smashburger is a signal of woke millennial trendiness, but McDonald’s is so déclassé that the taxpayers of Croton issued a bond to pay for the $900,000 purchase of a plot of land that McDonald’s once threatened to purchase. Croton is a relatively wealthy and homogenous community. The last thing that our Mayor should be reinforcing is a classist bullying based on personal food choices. The National Eating Disorders Association tells us that we should address our concerns in a “loving and supportive” way. Michelle Obama did much good work with her “Let’s Move” campaign and the “Chefs Move to Schools” program. Ms. Obama was always supportive, and even those who disagreed with some of her positions on school cafeteria diets knew that she was coming from a perspective of love and compassion. I hope that Mr. Pugh gives some thought to expressing his views on diet in a more loving and supportive manner. Eating at McDonald’s and consuming Diet Cokes may be tied to health problems, but it is not a moral failing. Being overweight and insufficient exercise are issues most of us struggle with, but those are not moral failings. Mocking people online for their diet and lifestyle choices is a moral failing, and a bad example for our young people. It needs to stop.